With the weather cooling down, fantasy leagues maxed-out and team colors proudly on display, one thing is certain – football season is upon us! That means it’s time to take advantage of the autumn weather, head out to the stadium or your own background and fire up the grill and host your own tailgate party! For me, I could care less about the game, but the tailgating...that's where it's at. Hormel Foods recently conducted a study to better understand football fans, the importance of tailgating and favorite tailgating foods. 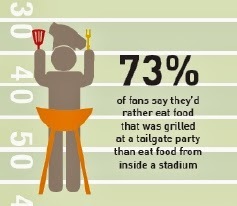 According to the study, more than 76 percent of fans say tailgating is a crucial part of the game day ritual and 73 percent would rather feast on their own menu versus stadium food! Do you have any tailgating and game day favorites? Whip up this dip featuring delicious Hormel® pepperoni (regular or mini sized!) to bring to your tailgate. Prep time is less than 30 minutes! Heat chili according to package directions in microwave or on stovetop. Place chili in small black bowl for "witch's cauldron." Cut each strip of dough lenghtwise in half. Shape dough into 16 "bones" of various sizes. Place on baking sheet. Bake breadsticks 5 to 8 minutes or until crisp. 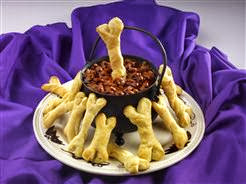 Serve "bones" around chili "cauldron" for dipping. And bringing something like this out at your next Tailgate or Party..is SURE to get people talking too! How often do you tailgate? How important is food to your tailgate? What is your favorite tailgating recipe?